In shaping architecture, virtual models ultimately define what a human body is and its optimal parameters, while the non-standard body, the unrecorded other—often marginalized in terms of class, gender, race, or disability—is rendered non-existent. An essay by designer Simone C. Niquille, also published in WORK, BODY, LEISURE, 2018. Detail of 'Geometric Man', after Erhard Schön 1540. Simone C. Niquille, 2018. A map projection is the translation of three dimensional coordinates onto a two-dimensional plane. Without projection, there would be no maps. The world around us would be impossible to represent and navigate. To make sense of the world around us, it had to be translated, flattened. Now the world fits in our pocket. Map projections inevitably produce distortions. Therefore, several different calculations exist, each producing another representation with different truths. Google Maps, for example, is based on the Mercator Projection. Based on a grid of straight lines, it is favored by explorers to navigate vast oceanic distances. Our own orientation within the world is dependent on map projection. We are used to seeing the earth’s sphere flattened in a specific way. Seeing it unfolded differently is disorienting. If North is suddenly at the bottom of the map rather than on the top, not only our orientation shifts, but also the hierarchy of territory. Map projection techniques therefore greatly influence not only our positioning in the world, but also our perception of reality. The map projection frames what was previously three-dimensional on a fixed two-dimensional plane. An all too standard reproduction of the Western World in the center carries more meaning than a mere necessary choice. Map projections create the world as we see it. Africa is the second largest continent, but it doesn’t “look like it” on Mercator maps. Views of Sylvie Gourand, whose face was used in Henri Gouraud, Computer Display of Curved Surfaces, a research publication completed under Ivan Sutherland at the University of Utah Department of Computer Science in 1971, in the development of Gouraud shading. Computer Generated Imagery (CGI) faces a similar challenge: How to mathematically capture the world around us to recreate it within the binary language of the computer? CGI relies on the systematic placing of coordinates on a grid. Rather than flattening a three-dimensional object, however, CGI attempts to reproduce a virtual three-dimensional object on a two-dimensional screen. The ultimate challenge of CGI is to reproduce a lifelike human figure with all its imperfections in the binary environment of computation. Early attempts at CGI mathematically reduced the human form to simple geometric shapes that could be redrawn as virtual coordinates. With increased computing power, its form began to take on crude anatomy. The synthetic, plastic quality of CGI rendered the human form utterly creepy. The shape was recognizably human, but the movements and appearance far from it. Not quite a virtual replica, not quite breathing flesh, these early models were digital Frankensteins: monstrous human copies, experiments of science at once successful and haunting. They were inhabitants of mathematically hygienic computation, stripped of all the incalculable imperfections, fluids, dirt, sweat, injuries and age that define human life. In a 1995 Wired article on 3D scanning technologies entering Hollywood to digitally replicate actors, journalist Paula Parisi foresees a necessity for “dirty” CGI: “The absolute imperfection of living things is a renderer's nightmare. For many, the ability to generate a photorealistic human, an artifactor, remains the elusive goal.” Experiments towards digitizing the human form assert the difficulty of measuring and standardizing living breathing diversity. Albrecht Dürer, Draughtsman making a Perspective Drawing of a Reclining Woman, ca. 1600. In Western society, the mapping of the human body is rooted in a historical attempt to understand (and ultimately conquer) nature. German painter and printmaker Albert Dürer published his design for a “perspective machine” in 1525, in which his drawing subject would pose behind a glass sheet covered with a grid while the draftsman would fill in an equal-sized grid on a sheet of paper. Using the grid as a guide, Dürer was able to apply perspective to the drawing. Proportional geometry introduced a new power structure shifting man into the center. Suddenly the world could be measured, analyzed, understood. The discovery of perspective in drawing was a god-like invention, making possible the scaling of any figure, object, or space proportionally, continually producing an image that seemed to reflect reality truthfully. This attempt at representing the world as it appears is intrinsically linked to gaining power over the depicted subject. It introduced the notion of a “right perspective” and “correct way” of seeing reality. The perspective machine was effectively a tool of oppression by enforcing one “right” perspective, a reductionist practice in which men aimed to understand the world around them by literally superimposing an arresting grid. A weapon against the unknown Other. A single illumination or fresco might include several clearly differentiated ‘nows.’ In one picture St. Paul’s ship may go aground, he may struggle to shore and then preach to the pagans. That equals three ‘nows’ and may well confuse us. Even a single medieval ‘now’ can be confusing. Today we usually think of pictures as depictions of what existed and was happening in a knife-edge instant; that is, the ‘now’ of a sixteenth century fresco of the Holy Family’s flight to Egypt or of a twentieth century photograph of a family picnic are essentially the same . Such a technique of composition captures another reality not visible to the human eye. Perspective drawing introduced an understanding that the only reality is the one observable by sight. Contrarily, 3D generated imagery is a constructed composite simulating reality, measured according to its “truthful” depiction. Demonstration of four common map projection techniques on a human head, from Charles H. Deetz, Elements of Map Projection with application to map and chart construction, 1921. The 1970s and 1980s mark the heyday of attempts to digitize the human body. Much of the foundation of contemporary 3D technology was developed at the department of Computer Science at the University of Utah, which was led by Ivan Sutherland, author of the influential 1965 essay “The Ultimate Display” that foretold the development of contemporary graphical computer interfaces, from 1968 to 1974. The department produced alumni such as Ed Catmull, who later went on to create Pixar, which to this day, defines the aesthetic benchmark of commercial CGI. In 1972, together with Fred Parke, Catmull presumably created the first animation of a human hand and face in what has become a legendary short film, A Computer Animated Hand. In a technique not unlike Dürer’s perspective machine, Catmull drew 350 polygons on a plaster cast of his hand, measured their coordinates, and inserted the data into a custom software to recreate the hand by drawing 350 virtual polygons. What now looks like a low-resolution video was shocking in 1972. Computer screens at the time barely displayed still images. Towards the end of the film, the virtual camera turns around the hand to where the wrist would attach to the arm, revealing it as a hollow surface model. The camera then moves into the hand’s shell and turns on its axis, realizing the perspectival power of a virtual camera for the first time. Not only can reality be rebuilt on screen; perspectives can be altered. Still frame from Edwin Catmull, A Computer Animated Hand, 1972. We combine Hollywood’s motion-capture technology with human modelling software in our Detroit labs to design jobs in Asia and around the world that are less physically stressful on workers. We adjusted the sizes of our Jack and Jill models to reflect the populations at our global plants so all our regions can benefit from what we’ve learned. Anthropometric databases contain measurements of specific populations. The ANSUR database, for example, the database upon which Jack Siemens originally was built, is a US Army survey of its troops in 1988. No database can be universal and will always cover a specific target group, yet for an accurate ergonomic analysis, it is paramount that the database corresponds with its intended audience. Using the ANSUR database to analyze joint stress at a factory in Germany, for instance, wouldn’t produce representative results, regardless of the sophisticated computation. The input data, the body measurements, are different than the real people it represents. Rendering of Jill, from Siemens Jack. Unlike Le Corbusier’s Modulor, whose body measurements embody one standard, Jack and Jill’s anthropometric parameters are potentially capable of representing a diversity of bodies. Devised in 1943 in response to a call by the French National Institute for Standardization to standardize all objects part of the construction process, Modulor’s blatantly biased, unscientific source is cited by Le Corbusier as “English detective novels, the good-looking men, such as policemen, are always six feet tall!”  Le Corbusier’s intentions were to replace complicated metric-to-imperial conversions by using the human body as a universal measuring unit. But such standardization reduces all bodies to one. The spectrum of possible bodies is excluded in any architecture devised with the Modulor system. Designed to be read as objective mathematical truth, Modulor is superimposed with the golden ratio and segmented into a harmonious sequence based on Phi (Φ). As a result, Modulor appears scientific, masking its violent, exclusionary, and discriminatory parameters. The interface with which a software’s parameters are presented is equally important to inclusive design as the input data itself. A development towards more inclusivity begins with the labelling of data and extends to the software’s graphical user interface. The standard digital Jack and Jill have light skin and brown hair. The male model is slightly larger than the female. Their image is one of serene suburban harmony. But who do they represent, and what anthropometric database is defining their size? How can one digital human model’s appearance represent a whole population? Reporting on the recording of the CAESAR anthropometric database in the US, Italy, and the Netherlands during the early 2000s, documentation documents read: “In The Netherlands and Italy the ‘white’ group was defined as those subjects for whom both parents were born in the country. All remaining subjects were in the ‘other’ group. In Italy it is against the law to ask race and in The Netherlands this manner of asking this question is in correspondence with the Statistics Netherlands data.” Beyond the problematic assumption that any person of whom both parents were born in the Netherlands or Italy are automatically categorized as “white,” once such data is accessed through a graphical user interface, the dropdown menu will not feature this explanation and the category “white,” which is already non-descriptive of the captured subjects, is rendered default. Nevertheless, similar to Modulor’s mathematical representation, the ergonomic software’s interface renders the “white” body measurement data scientific and objective. Over time, and with accelerating computing power, the appearance of Jack and Jill has undergone a resolution increase: from the early, crude, skeletal stick figures to basic geometric volumes reminiscent of Oskar Schlemmer’s Triadic Ballet to today’s photorealistic textures. Tom Hoffman, director of Tecnomatix Global Marketing for Siemens PLM Software, including Jack, links the need for photorealistic appearance to contemporary computer game aesthetics: “[Researchers] may focus on ergonomics, on answering specific questions, but the people they present their findings to—upper management—are usually influenced by the visuals they’ve seen in the games their kids are playing. So they find it difficult to trust analysis results where figures look inferior to what they’re used to seeing in video games. That’s a challenge we recognize.” Some digital human models take personification a step further than their appearance: Teo, the male avatar embedded in the CATIA software by French company Dassault Systèmes, even has his own Facebook profile. Facebook profile picture of Teo From-ds uploaded on November 23, 2011, the male avatar embedded in the DELMIA and CATIA software by French company Dassault Systèmes that uses the ANSUR II database, based on an updated anthropometry survey of the United States army. Architecture is built around the figure of the human body. Think of “Steve", the middle-aged male avatar wearing a green parka, patiently waiting for someone to launch SketchUp. He is the default inhabitant around, and for which design will take place. Trimble Inc., SketchUp’s parent company, refers to his role in a similar way to that of Le Corbusier’s Modulor: as a scale figure, a point of reference, a reality check within the virtual infinity; the ideal measurement upon which the built environment should be based. Le Corbusier himself applied his measurement system in several buildings, most notably the Unite d’Habitation in Marseille: a large housing complex comprised of 337 individual apartment units, each perfectly optimized in every dimension to fit a family of Modulor’s. Contemporary architectural practice uses parametric design as a way to model, optimize, and simulate the built environment. 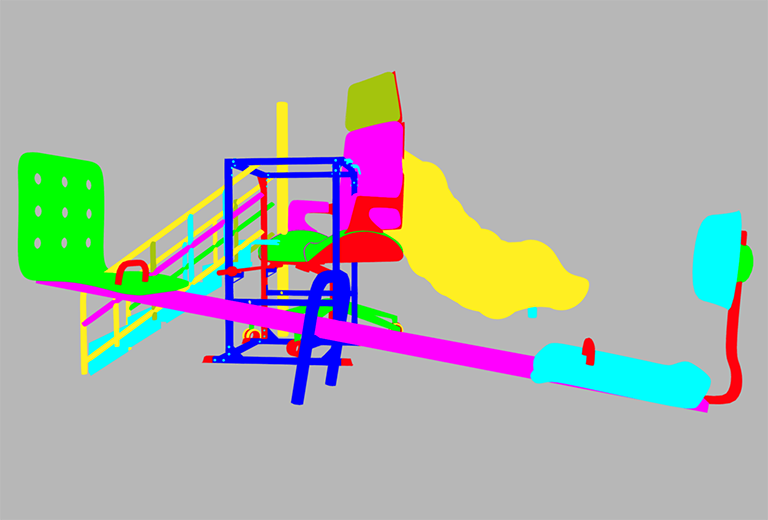 Guided by input parameters and variables, computation in architectural design makes possible intrinsic structures and grand algorithmic volumes, as well as the calculation of optimized factory floor layouts, emergency exit paths, individual workstation ergonomics, and the like. Anthropometric design and ergonomic analysis, such as calculated with the Modulor standard, can now be executed through software. Are these ergonomic simulation softwares, by shaping architecture, ultimately defining what a human body is? As an antithesis to parametric design, the Reversible Destiny Lofts Mitaka, In Memory of Helen Keller built by Shusaku Arakawa and Madeline Gins in Tokyo exemplify what a space designed for a possible body, rather than a standard one can look and feel like. Without standardized proportions, right corners, and neutral colors, the apartments are an assembly of spheres, cubes, and cylinders stacked and fused into each other to create rooms. The floor isn’t flat, but rather covered with small bumps. In an interview, Momoyo Homma, director of the Arakawa + Gins Tokyo office, tells the beautiful story of a visit by her elderly mother who is dependent on a cane. Initially, Homma was worried how her mother will be able to move through the apartment, as it seemed difficult to walk on the floor with her cane. After visiting, however, the mother exclaimed: “Well I don’t need my cane here, because this floor is so secure for me. I can feel like my feet, each foot, is grabbing each bump. I love this floor!”  Arakawa and Gins questioned standardized construction methods and what it meant to build for the human body. Could the built environment expand our own bodily experience? Why are floors flat when our feet aren’t? A Roomba would have a hard time autonomously vacuuming the apartment, but the human body’s experience of space would be greatly enhanced. We aren’t machines after all. Page from Erhard Schön, Unnderweissung der proportzion unnd stellung der possen, 1540. Source: Saxon State and University Library Dresden. Far from being a neutral tool, design software is encoded with politics. Their underlying parameters need to be examined, challenged, and questioned. What is the default setting upon start-up? What data categories define menu options? Which input fields are obligatory for calculation to compute? Whose data does the default white skinned avatar represent? Arakawa and Gins designed the Reverse Destiny Lofts with Helen Keller in mind, the quintessential antithesis to the standardized human body that the Modulor depicts. Rather than optimizing space and building processes, their design allowed for a sensory experience of the space within which the body lives, is activated, and is challenged. Could architecture, designed for specific bodies, generate alternate experiences and perspectives? Similar to a virtual camera in three-dimensional space that has the ability to observe from multiple angles producing various realities, each one truthful in their own right, architectural space designed with an anti-standard body—a Queer Modulor—would perhaps allow visitors an alternate perspective to their own. Rather than a new attempt at an anthropometric standard, the idea of a Queer Modulor proposes a deconstruction of existing body measurements, representations, and interfaces to allow for multiple realities. Measuring produces the conception of being in control, of understanding through analysis, reduction, and sortation. In turn, the unknown Other becomes excluded, and as such rendered non-existent. Historian Alfred W. Crosby describes Western society’s obsession with measurement and quantification as it occurred during a shift between auditory to visual authority in information transmission during the twelfth century by describing a society within which “the recipient of light ruled: the eye.” A similar analogy could be drawn today. The emitter of light is the computer monitor. Mirrored in the recipient’s eye: the graphical user interface. 1. Johan Huizinga, The Waning of the Middle Ages (New York: Doubleday, 1954), 284. 2. Yanni A. Loukissas, “Keepers of the Geometry,” in Simulation and its Discontents, ed. Sherry Turkle (Cambridge: MIT Press, 2009), 153. 3. Denis Wood et al., Seeing Through Maps: Many Ways to See the World (ODT, Inc, 2006). 4. Alfred W. Crosby, “The Measure of Reality: Quantification and Western Society, 1250-1600” (Cambridge University Press, 1997), 168. 5. Le Corbusier, The Modulor: A Harmonious Measure to the Human Scale, Universally Applicable to Architecture and Mechanics (Basel & Boston: Birkhäuser, 2004), 56. 6. Kathleen M. Robinette et al., Civilian American and European Surface Anthropometry Resource (CAESAR) Final Report, Volume I: Summary (Dayton, Ohio: United States Air Force Research Lab., Human Eﬀectiveness Directorate, Crew System Interface Division, 2002). 7. Kenneth Wong, "In Harm's Way," Computer Graphics World 35, no. 5 (Aug/Sept 2012). 8. Momoyo Homma, “‘We Have Decided Not to Die’ The Work of Arakawa and Madeline Gins,” The Funambulist 7 (2016). 9. Alfred W. Crosby, “The Measure of Reality: Quantification and Western Society, 1250-1600” (Cambridge University Press, 1997), 133.